Happy New Year, everyone! If you visit the farm this month, it won’t look like much is happening. The ground is frozen, the trees are bare, and the greenhouses are empty. The only sounds you can hear are cars and birds and maybe a dog barking in the distance. That said, I’ve begun to prepare for the next growing season. You’ll notice that I’ve removed the plastic covering from our high tunnel greenhouse, in preparation for replacing it before we plant tomatoes in May. . The polyethylene plastic that is used to cover most greenhouses has a lifespan of about 3 years. After that, the plastic begins to degrade from extensive sun and wind exposure, which reduces light transmission and in turn can affect the growth of the plants inside. Taking the cover off now enables us to expose the soil to rain and snow, so we also flush out any build up of salts, hard water deposits, and other minerals. I also covered the garlic with leaves. 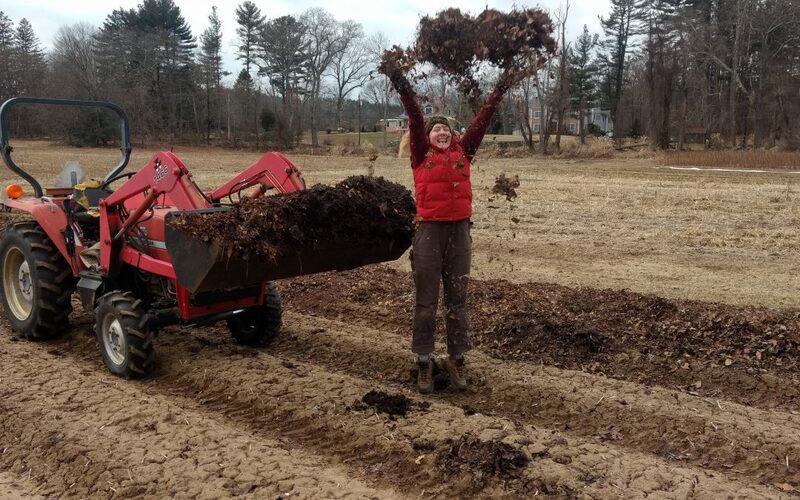 Local landscapers dropped off several loads of leaves this past fall, and I spent a few days recently using the tractor to spread bucketloads of leaves over our five garlic beds. The freezing and thawing of the ground during winter can heave the cloves up closer to the surface and expose them to the elements, potentially damaging the plant. The leaf cover gives the garlic an extra layer of protection and insulation, and it helps to reduce erosion, as well as suppress weeds as the weather gets warmer. Lastly, I have hired an assistant manager to join the Stearns Farm community this year. Kerry Beyer comes to us from Wappingers Falls, N.Y., where she spent two seasons on the vegetable crew at Fishkills Farms and another two years working in the fields and the stillhouse at Coppersea Distillery. I am very excited to have hired someone who has a true passion for farming and being connected to the land and the community that supports it. I look forward to getting to know her and introducing her to all of you.